A late 1974 arrival to the AHM roster, the EMD FT-A unit had a short life in this HO-scale version. By the 1980 AHM Catalog, this early cab unit is no more. The AHM FT is reviewed in the January 1975 issue of Railroad Modeler magazine. The CB&Q example is pictured. The review states that AHM was offering its FT decorated for Amtrak, ATSF, ACL, CB&Q, Spirit of '76 and UP. I have no reference, beyond this mention, that AHM cataloged or made a Santa Fe and/or Spirit of '76 FT model. 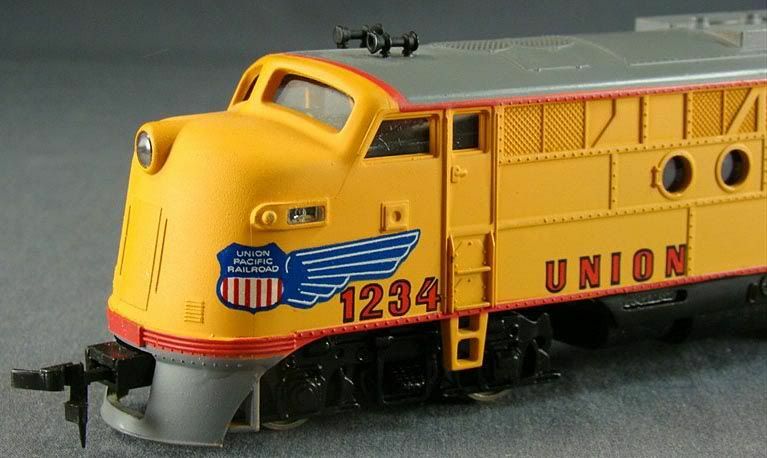 Very similar to the FT offered by Bachmann in the late '70s, it is possible the AHM model was made from the same molds at the Bachmann that arrives for that company in 1978. The drive found in the AHM FT is an 8-wheel type that appears to resemble the early '70s Bachmann F9 drive in many respects. Below is AHM's ad from the February 1975 edition of Model Railroader magazine announcing the then-new HO-Scale FT-A Diesel. Read more about the prototype FT diesel, including a listing of original buyers at Wikipedia.org.